Best Guitar Tonewood / Best Ukulele Tonewood ? Many guitar/ukulele makers, whether big factory guys or quiet luthiers, have their standard lines of models offered in one, or just a few, types of wood. You’ve got your Model A (built from mahogany or Indian rosewood), Model Z-1 … that kind of thing, and then you may have some choices to customize within the parameters of those models. Heated discussions can take place between luthiers over which tonewood is the best, each being steadfast in the belief that the wood they work with is the best guitar tonewood. Because Jay has no standard models, he has no constraints when it comes to instrument design and wood selection. 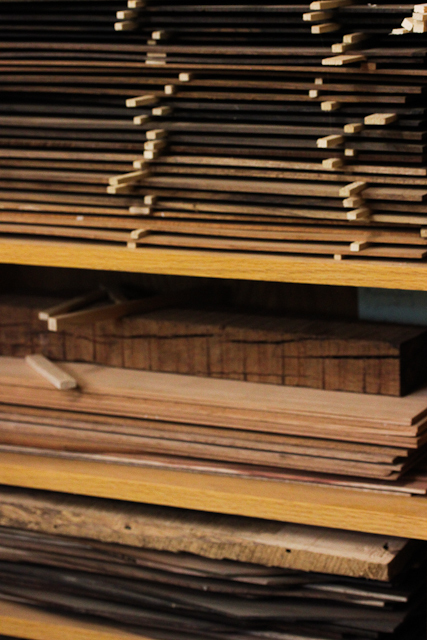 As Jay approaches building his next instrument, he literally looks through our amazing collection of tonewoods and soundboards and he lets the wood decide. Which piece of wood really wants to become the next guitar? Which set of wood feels just right in his hands and will inspire the building of a special instrument? Each species offers something unique to the complexities of the build process and to the final sound and he takes all of this into consideration. When Jay is building a custom order instrument he takes that a step further and invites our customers to the wood pile with him to choose their own set of wood. Of course, when distance is an issue, customers can look to our acoustic guitar wood galleries and our ukulele wood galleries to choose. An important point to make is that we have carefully procured an enviable supple of high quality wood so when he takes a trip to the wood pile he is picking from a diverse collection of the best of the best. When asked what is the best guitar tonewood or best ukulele tonewood, Jay points to the great tonal quality from all of our instruments. Each has that special something that can only be described as a “Lichty” and too, each has its own unique voice. 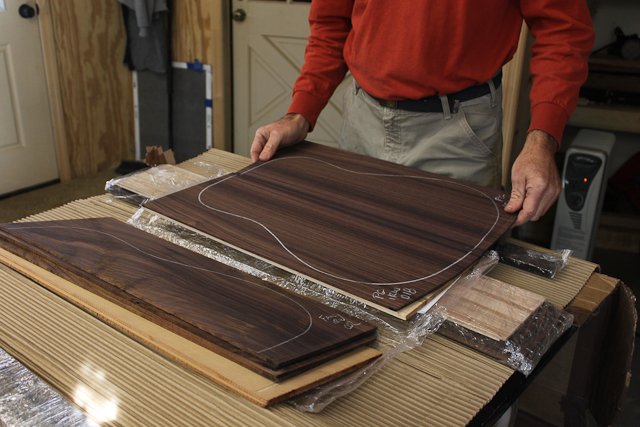 When pressed, Jay would have to point to Chechen, Cocobolo, Brazilian Rosewood, Wenge and Pau Ferro as some of his favorite tone woods (oh, but there are so many more!) Regarding soundboards, Sinker Redwood and Sitka Spruce consistently produce the tap tone he is looking for, yet there are many other stellar options. It really comes down to personal preference for the players. 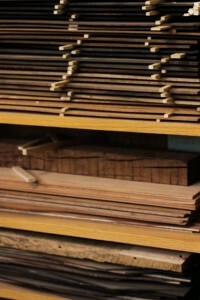 Tonewood and the soundboard are two important factors that impact an instruments sound but they are not the only ones. The type and thickness of the bracing material and the type and thickness of the finish are two more of the many factors that contribute to the end result. You can imagine how much fun this building approach is for Jay. The joy and inspiration that comes from crafting each instrument as a one-of-a-kind, choosing not only the set of wood but the binding, rosette design, bridge, etc as he goes, is a winning formula for both the luthier and for the customer. The end result – the magic in the making of each Lichty guitar and ukulele shows through in acoustically and esthetically captivating instruments. 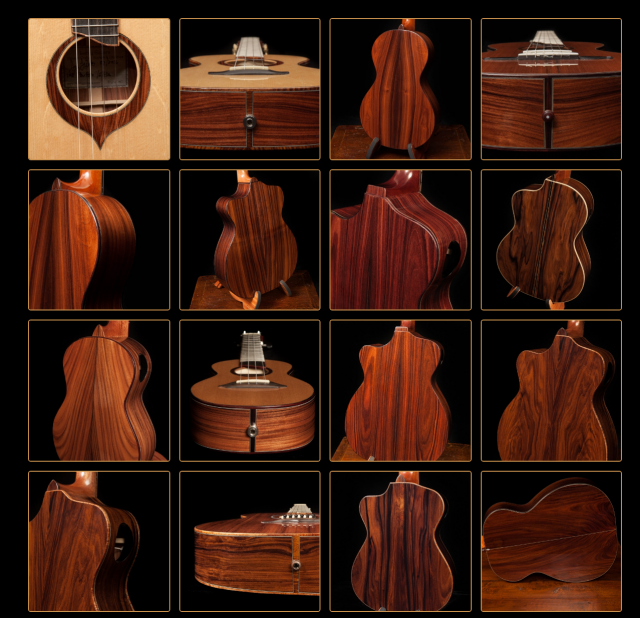 You can visit our Acoustic Guitar Wood and Ukulele Wood pages to see all currently available sets and to see photo galleries of finished instruments built from most species. 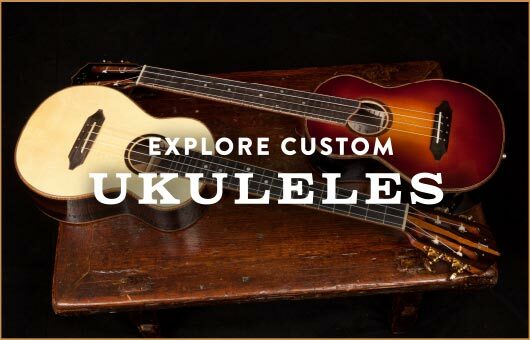 Look to our Handmade Acoustic Guitars Ukulele For Sale page to see and hear currently available instruments. 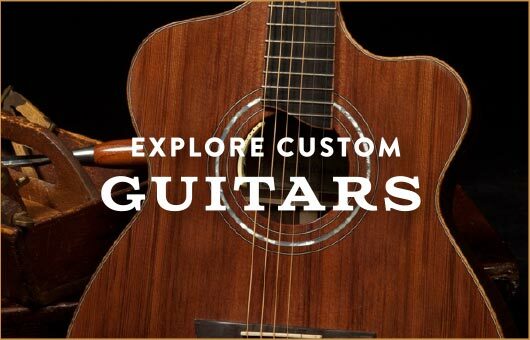 Learn how to customize your own guitar or ukulele.